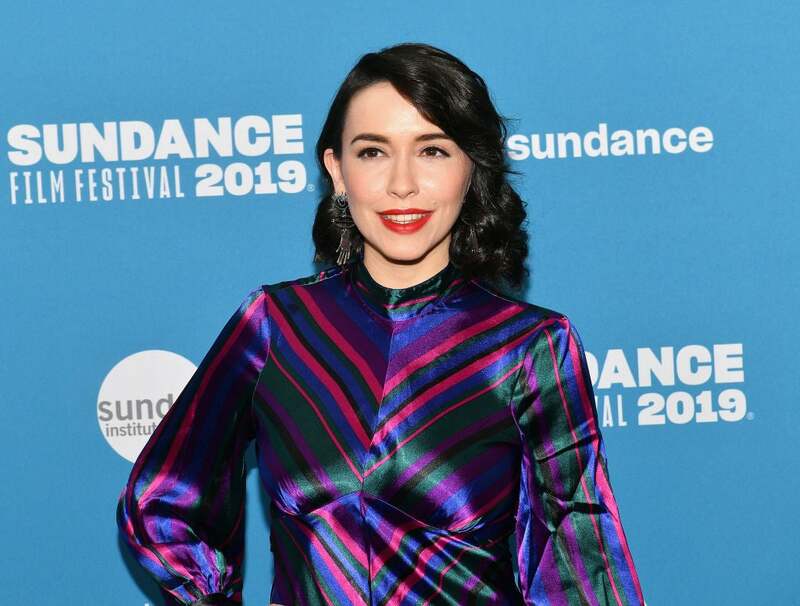 Alice Waddington’s debut feature Paradise Hills has definitely been one of the surprises at the Sundance Film Festival: an indie gothic sci-fi fable is not something you see every day, after all. Especially not one that is a feminist parable, directed by a twenty-something first-time female director with a starring cast also made up of young women, including Emma Roberts, Eiza González, Awkwafina and Danielle Macdonald along with Milla Jovovich. The movie takes place in an undetermined island, in an equally indeterminate future, where rebellious young women are carted off to be re-educated, in order to adjust to what society demands of them. However, it’s not necessarily the plot, but rather the aesthetics, that promise to turn Spaniard Alice Waddington into one of the most prominent among the new voices emerging from this year's Sundance. Thoroughly original, Paradise Hills is a remarkable achievement in film design, from art direction to costume design, with a look that harkens to 70s European cinema such as the gothic horrors of the legendary Hammer studios which Waddington referenced at the packed Q&A along with shows like The Prisoner. The Bilbao-born daughter of Spaniards has a background in costume and directing shorts and shows a consummate command of cinematic vernacular. The director, whose real name is Irene and who refuses to give out her original Spanish last name, talked exclusively to goldenglobes.com. The crucial theme of Paradise Hills is identity, and in the film, someone makes an effort to be something different than what was originally meant to be. Do you see yourself reflected in this story? I’m a privileged person but it’s true is that I’ve gone through similar circumstances, simply by living in the world as a woman, where you are bound to experience them. For instance, many times I’ve felt the pressure to fall within a general beauty stereotype that does not fit well with me. I’ve felt the pressure for being atypical and for my gender identification, as well as from the binary attraction point of view when I don’t really feel comfortable with those values… So, in short, yes. In 2015, I took Disco Inferno, my first black and white short, an homage to Georges Franju, to the Fantastic Fest in Austria, where we won as Second Best Project in the film market, with the pitch I’ve made, and also Best Direction. The pitch was Paradise Hills the motion picture with which I’ve made contact during the festival with Guillermo del Toro, who was there presenting Crimson Peak, as the surprise screening of the festival. He loved the short and introduced me to his manager, who introduced me to my eventual producers, Adrián Guerra and Núria Valls from Nostromo, whom I’ve met in Barcelona when I went to Sitges. I took them the treatment I’ve written with Sofía Cuenca, also the author of Shrew's Nest (2014, prod. by Alex de la Iglesia) and told them “I think it’s not bad what we’ve done so far but what’s missing is to bring some fresh eyes on the idea.” Since I’ve known Nacho Villalongo, I proposed him to develop the script with a new structure, and then Brian DeLeeuw came in, brought by Adrián and Nuria, who is a novelist and a screenwriter, and this is when, between Nacho and Brain we developed the script, under my supervision, to give them the female point of view, because they are after all two men and this is a movie about women. Nacho knew me well enough to change all the stuff that had nothing to do with my personal experience as a female. Paradise Hills is full of references to other movies like Clockwork Orange and even Star Wars. In which way do you believe those films made you into the director you are today? I’m generationally a millennial. I’m 28 and I think that being raised in the age of the internet, I’ve had a series of influences at my fingertips, therefore I’ve grown with, for instance, Japanese anime, especially those designed by women like Chobits, created by the Clamp manga collective, and Your Eyes Only. I’ve also grown with cult movies like The Abominable Dr. Phibes or the British TV show The Prisoner who is a direct and strong influence. I also grew with the strong influence of the Hammer films from the 60s and 70s. My parents are fans of genre films. My mother showed me Dogville from Lars von Trier when I was 15 - what I mean to say is that they’re cinephiles. My father had a movie club when he was young and worked at the university; besides, I’ve researched on my own and let us say that my love for comics has transferred into my love for genre films. In the movie there are video game elements akin to Final Fantasy and there are also a Grace Jones’ style video influence, as well as references to Picnic at Hanging Rock and The Abominable Dr. Phibes; in fact, the movie it’s a bit like that - the first half is the emotional conversations among women and the other half turns into an action movie, similar to what we’ve seen before but with a different kind of protagonists. 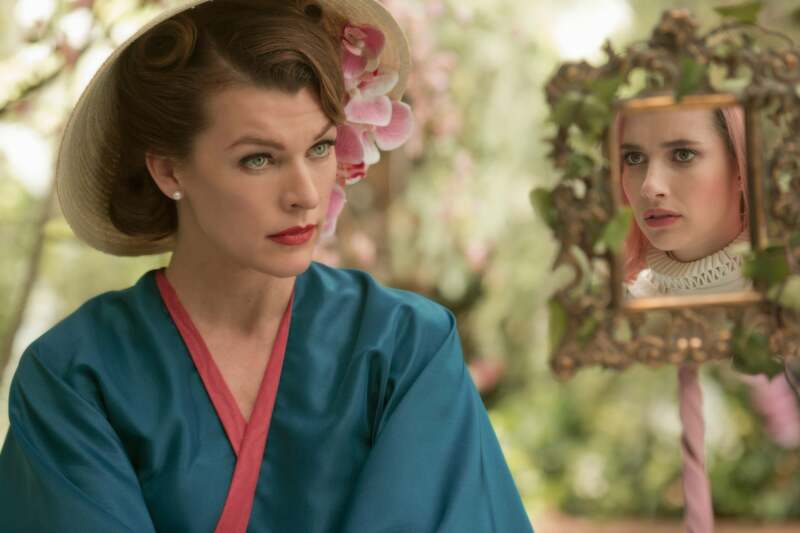 Mila Jovovich and Emma Roberts in a scene from Paradise Hills. This could’ve been an American production, given the quality, however, your entire crew is Spanish. Do you think Spain is up to par with anyone else when it comes to making movies? Definitively. I don’t think we have to have any cultural or creative complex about it. I think we, cinematically and creatively in general, worked very hard and this will sound like a cliché but we have very good film crews in Spain. There are excellent heads of departments, truly extraordinary. Laia Colet, our production designer, or Alberto Balcarce, our wardrobe designer; same for Josu Inchaústegui, our director of photography, all of them and many others are to blame for our extraordinary visual achievement, and they’re all either Spanish or Catalonian. It’s very beautiful that these things are kept at home but we shouldn’t feel any less proud in regard to our capacity to develop and produce visually complex movies, even when it involves the construction of a world from scratch. In fact, the one thing about this film is that has been a great challenge was to construct this fantasy world with real locations. There is one such place that feels like a set but it isn’t and that’s the cave. It’s really incredible that we’ve been able to accomplish this in Gran Canarias. Our art and research teams did an extraordinary job. It’s true that I’ve always been interested in the visual arts. I’ve always been curious about comics and to be honest, since I was 13 I became interested in clothing and wardrobe design so I contacted for the first time a local runway in Bilbao to try to present a fashion line, considering myself a designer by age 14, and was only unable to do so due to the enormous costs that this signifies, that my parents couldn't afford, but this was also the reason I was not able to attend a film school. I couldn’t allow myself to do it but they send me to a public college to study advertising. It wasn’t completely my choice but afterward, I worked in a dozen shorts and feature films as an unpaid camera and production intern, along with Quique López, a Spanish director of photography who was like my mentor, and later I worked in commercials while I was completing my studies. At the same time, I began to shoot fashion photography- the first time I collaborated with Harper’s Bazaar I was just 18 years old. I’ve always been interested in fashion and in the visual arts but because I couldn’t find as much work as a photographer as I would have liked, because it is a field dominated by people with more experience than I, my mother suggested me to make fashion films and, really, this is all her fault. Suddenly I realized that these fashion shorts and those making-of videos were small pieces of narrative film, even if a little surrealistic, and from there on the idea began to evolve to where I am now.